How many times have you checked up on a child that was sleeping a little too long – only to ruin that moment? How many times have you wished for a little bit more beauty sleep, but woken up your infant while checking if she is okay. I’ve definitely been there and done that. Stay close to the heart of your home from any room with a Safe&Sound® baby monitor. Refined audio and full-color video bring you every smile, giggle or sigh, so you’ll always know exactly how your little one is doing. 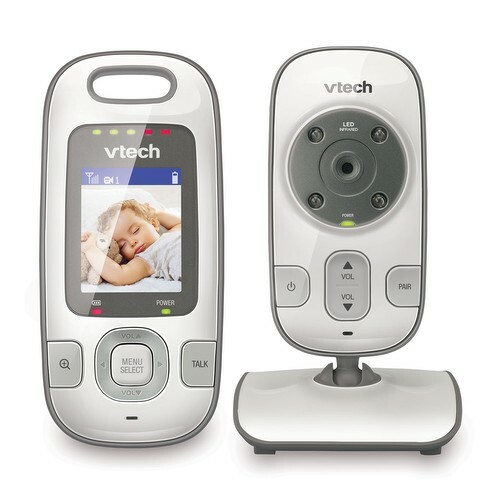 The VTech® VM312 Video Baby Monitor is a slim small monitor that has all the features you need in a streamlined design. The adjustable stand in the back allows me to get the perfect viewing angle. The talk back button lets me calm my toddler while I make my way to him, once he has woken. There are various brightness and volume settings too. Need to peek in on more than one room? Not a problem! You can add a few cameras, and watch them from the same parent unit, switching easily between them. The camera unit can be wall mounted, or sit on a surface. We have ours sitting on our windowsill. It was easy to position it to “see” my toddler in his crib. Or, mount it on the wall, and tilt it downward to get a clean overhead view. Peek in on up to four cameras with one parent unit. You can either choose which one to view, or you can turn on Patrol mode which switches between the cameras. Full motion video up to 25 frames per second. Automatically detects dim lights and switches to infrared night vision. Features an intercom mode to talk back to your child. Range: up to 1000 feet away, so you can take your unit and sit on the front porch while baby naps. Features a standard wall mount, or you can stand it on a surface. Originally published on 2015-08-13 by Menucha at Mom Blog Society .